It was never a question for Alex Honnold. When Brad Gobright and Jim Reynolds bested the speed record on the Nose route of El Capitan—which Honnold held for five years prior with Hans Florine—Honnold knew he was going to try and take it back at the first opportunity. The question was with whom? Florine had announced his retirement from the speed record on the Nose in his book, On the Nose: A Lifelong Obsession with Yosemite’s Most Iconic Climb, in 2016. Ultimately, Honnold chose Tommy Caldwell, 39, who achieved notoriety in 2015 for making the first free ascent of the Dawn Wall, located immediately to the right of the Nose and considered the toughest rock-climbing route on the planet. Caldwell turned out to be the right choice. 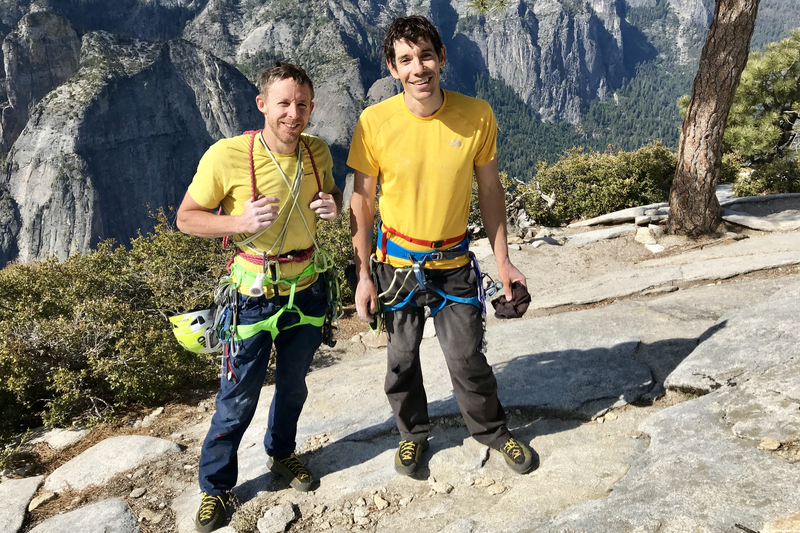 On May 30, he and Honnold set the speed record on the Nose in a blistering two hours, 10 minutes, and 15 seconds, more than nine minutes faster than the prior time, and 12.5 minutes faster than the time Honnold and Florine achieved in 2012. The new speed record on the Nose is the equivalent of a sprint for 3,000 vertical feet, while maintaining the strength and composure to manage the ropes and gear required to protect yourself in case of a slip. Men’s Journal sat down with Caldwell shortly after he and Honnold broke the record to find out how he pulled it off, and what he thinks of his first foray into speed climbing. You’re no stranger to the Nose. You’re one of a handful of people on earth who’ve free-climbed it, and you’ve even climbed it with Hans Florine back in 2001, but you were never interested in the speed record until now. What changed? I don’t know, really. It could just be because Alex asked me to. He was like, “You’re the best one to do this,” and that got me pretty psyched. We didn’t make a big deal about it or tell a lot of people about it. I wanted to be able to bail at any point if it seemed sketchy. Alex and I feel the same way about the speed record on the Nose—that it can be super dangerous, and that that’s not the way we wanted to do it. He’s like Uncle Alex to my kids, too, so he feels partially responsible for my family. When you see footage of Brad and Jim setting the record last year, they’re up there free-soloing without any gear between them, and they’re both fricking maxed out, and it looks so sketchy. But I know Alex doesn’t climb like that. And I was willing to try it to see if I could go fast without climbing like that. So, I went at it being of the mindset of, let’s just see. Let’s just see if it can be safe enough. I’ve been sort of multitasking. I’m on book tour [The Push: A Climber’s Journey of Endurance, Risk, and Going Beyond Limits was published last year. ], which is actually a good fit because you need time off to recover in between training runs. So, I came to Yosemite earlier in the month and Alex and I climbed the Nose three times in three days, then I left on book tour for four days. Then I came back and we climbed it two times in two days. Then I left on book tour for five days, and I came back to Yosemite a few days ago—and we’ve climbed it every day since for three days, including getting the record today. So basically, every day I’ve been in Yosemite [this season] we’ve climbed the Nose. And instead of going home to Colorado in between all the book tour stuff, I just come back to Yosemite. My family flew in on this latest trip because two weeks is about the max I can handle being away from them. It was great because they were here for the big moment. How did the training help? I felt like I was getting more and more in shape each time we did it. The first couple times, by the time we’d get to the top, I’d be cramping up in my hands and stuff, and that’s not happening anymore. I feel a little more powerful, like I can climb the last pitch faster now. And my breathing is much more controlled. Also, I didn’t think it was going to be nearly as fun as it turned out to be. I mean, hanging out with Alex is always fun, but the speed climbing itself. It’s pretty exhilarating to be getting to the top of El Cap that quick. You took a big fall during training. What happened? Yeah, I fell about 100 feet in a section of the route called the Stove Legs. I think I was just kind of going a little too fast. It was probably our third training climb on the Nose, and I hadn’t climbed on El Cap for a few years, so I just didn’t have my head wrapped around it. The reason the fall was so long was because it’s logistically at this spot on the route where Alex takes me off belay for a little bit. He’s still tied into the other end of the rope, so I’m protected, but there’s like this 100-foot loop in the rope. [Laughs] It’s actually quite easy climbing at that spot. And I was totally fine; I didn’t get hurt at all. I’ve fallen that far a few times in my life, probably a handful of times. Once I stopped falling, I just chalked up and started climbing again right away. We ended up doing the route in like 2.5 hours that day, which was fast. But then, for the next couple times, we were like, okay, we’re going to slow it down, get everything on lock-down, figure out the moves, before we try and go fast again. It was a good learning experience. What was your family’s reaction to you going for the speed record on the Nose? Becca [Caldwell’s wife] and my parents expressed concern, like, “Be safe,” but basically trusted me. I think Alex was taking on more of the risk because of the way we broke up the climb. I led the first half, and he led the second half. And the way the logistics work out, the second half is where you have the danger of taking big whippers. I wasn’t looking at those kinds of big falls on my half. Alex had the harder block. Was this a one-off or will there be more speed climbing in your future? Nah, I feel like the Nose is the only big wall that people do this on, you know? It’s like the race track for speed-climbing big walls. All the other routes, well, if you’re going to do it, you’ve gotta do it on the Nose. REEL ROCK is currently working on a documentary chronicling Caldwell’s and Honnold’s record-setting speed climb of the Nose.